After a fall appearance at Kansas City’s Open Spaces festival, the ETHEL string quartet, along with longtime collaborator Robert Mirabal, will return to Kansas City as a part of the UMKC Conservatory Artist Series Saturday, Feb. 23, 2019, at 7:30 p.m. in White Recital Hall. On Friday, Feb. 15, the UMKC Conservatory Choirs will present their annual Celebration of Peace Festival, benefiting the Rose Brooks Center, at 7:30 p.m. at the Community of Christ Temple in Independence, Missouri. ETHEL was established in New York City in 1998, quickly earning a reputation as one of America’s most adventurous string quartets — heirs to the likes of the Kronos Quartet and Soldier String Quartet, and part of a generation of young artists skillfully blending uptown, conservatory musicianship with downtown genre-crossing — by playing with the intensity and accoutrements of a rock band. The New York Times has described them as “indefatigable and eclectic,” and The Washington Post declares that “in the hands of ETHEL, American music is alive and well.” ETHEL has traveled around the world collaborating and creating a renewed sense of community among musicians and fans alike. Nearly 200 works have been commissioned and composed, and ETHEL continues to be a trailblazer in contemporary music. 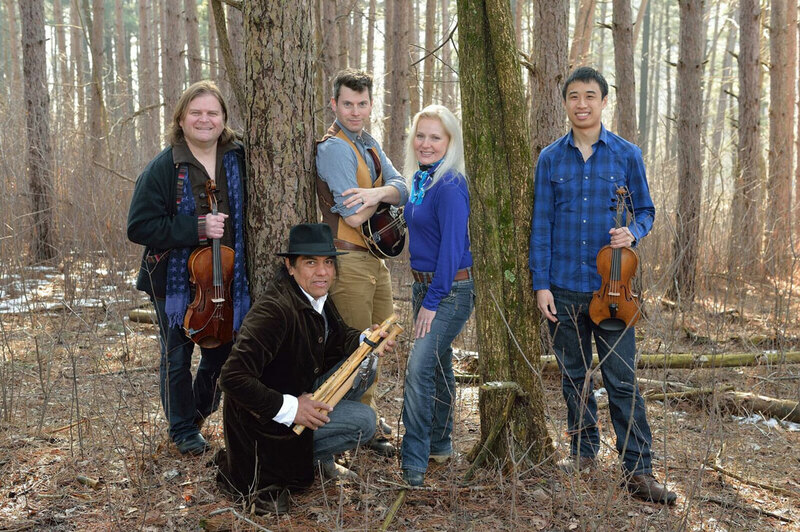 ETHEL’s current lineup features two founding members and Artistic Directors, Ralph Farris (viola) and Dorothy Lawson (cello), along with violinists Kip Jones and Corin Lee. This group has a continuing creative quest to celebrate community, blending sounds of new and old in a wonderful new tradition. They also have an ongoing dedication to working with indigenous peoples and their music, and in 2010 released the first commercial recording of American Indian students’ works. A collaborative ethos is the heart of ETHEL, a quest for a common creative expression forged in the celebration of community. One such collaboration, now in its seventh year, is with Native American performer Robert Mirabal. Mirabal is a Pueblo musician and world-renowned Native American flute player and maker from Taos Pueblo, New Mexico. An award-winning musician and leading proponent of world music, Mirabal performs worldwide, sharing flute songs, tribal rock, dance and storytelling. He was twice named the Native American Music Awards Artist of the Year, and received the Songwriter of the Year award three times. The latest inspiration for Mirabal and the ETHEL quartet is water, and its essential role in life on earth. Led by Mirabal, this adventurous and unconventional journey rushes through rapids and flows gently through still, sacred spaces. The accompanying album, The River, was recorded at Mirabal’s home on the Taos Pueblo, with the Pueblo River in the background providing inspiration as each artist contributed to the project original music or poetry with special significance. A true blending of cultures, influences for this project reach as far as India, Mongolia, Japan and Georgia. The Seattle Times noted that “The River resides somewhere beyond the intersection of ceremony and show biz, at a place where multicultural collaboration becomes sacred art.” Audience members are immersed in a flow of music, narrative and ritual that evokes timeless Native American traditions through contemporary musical artistry. This ethereal concert experience connects audience members to the movement of life within each other, and within themselves. This concert is sponsored in part by a grant from the James and Vera Olson Fund for the Arts. Tickets are available on our website, conservatory.umkc.edu, by calling the Central Ticket Office at 816-235-6222, or by visiting the Central Ticket Office in the James C. Olson Performing Arts Center. 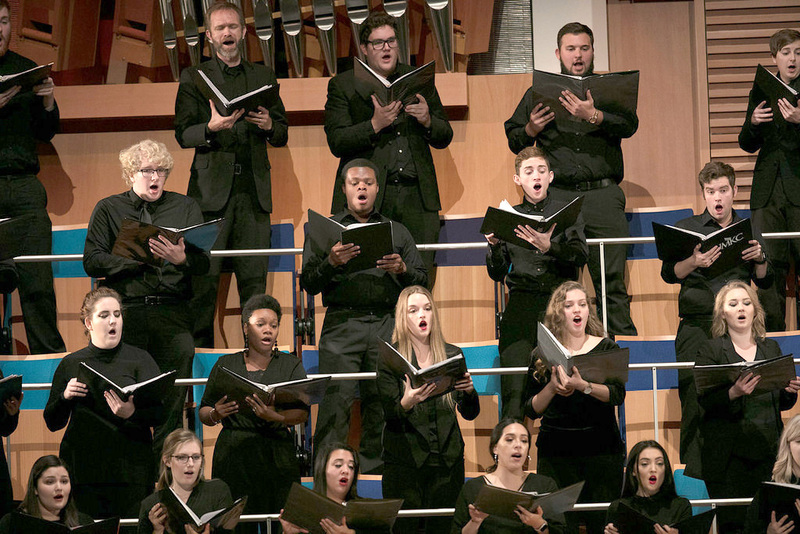 UMKC Conservatory Choirs will present the annual Celebration of Peace festival Friday, Feb. 15, at 7:30 p.m. at the Community of Christ Temple in Independence, Missouri. For this performance, Conservatory Choirs join with several area high school choirs to raise money for the Rose Brooks Center. The mission of the Rose Brooks Center is to break the cycle of domestic violence so that individuals and families can live free of abuse. The center protects hundreds of adults, children and their pets who need emergency shelter to escape life-threatening abuse, while providing children’s programs, court advocacy and therapy services to thousands in the Kansas City area. This concert is free, with donations to the Rose Brooks Center graciously accepted. This concert, and other Conservatory concerts that benefit Harvesters, Operation Breakthrough and the UMKC Food Pantry, demonstrate the Conservatory’s commitment to helping others in our community.